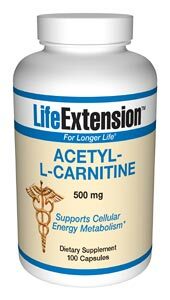 No adverse reactions have been reported in the studies on Acetyl-L-Carnitine at recommended doses. DIRECTIONS: Dosage can range from 1 capsule twice daily to 2 capsules 3 times daily. Can be taken with or without food. Studies in older people showed significant cognitive benefits persisted after ALC was stopped, so it can be used intermittently, if desired, for economical purposes. Other Ingredients: rice flour, gelatin, micro-crystalline cellulose, magnesium stearate, silica.